BRUICHLADDICH launch the world’s most heavily peated whisky with its Octomore 8 series. There has been a lot of innovation and new products coming out of Bruichladdich recently with their PHD Malts. “PHD” stands for Progressive Hebridean Distillers, which is essentially what Bruichladdich have been since day one. Progressive – because they are always challenging conventions. Bruichladdich intentionally set out to do something that had never been done before and Bruichladdich Classic Laddie is an example of this. When Bruichladdich created unpeated Classic Laddie it was challenging the perception of Islay whisky. To be a ‘proper’ Islay whisky implied you had to produce your own heavily peated whisky, so when Bruichladdich launched its unpeated whisky, it instantly challenged the status quo. Bruichladdich respects the past but doesn’t live in its shadow. They believe in innovation and progress while striving to create intriguing spirits. Hebridean – location, location, location. Islay is part of the Hebridean Isles (a group of islands off the West Coast of Scotland). They believe that Islay whisky should have an authenticity derived from where it is distilled and where it is matured. Distillers– Bruichladdich distil 4 different styles of spirits – 3 whiskies and 1 gin (The Botanist). They understand distilling to be an ancient art, one that has intrigued the human spirit for centuries. PHD Malts summarise these 3 unique characteristics of Bruichladdich Distillery’s philosophy. In the spirits of true innovation and progressiveness, the Octomore 8 series continues to push the boundaries of heavily peated whiskies. The team at Bruichladdich thought – “what if we could distil the heaviest peated barley humanly possible?” – and that they achieved in 2008 with the 1st batch of Octomore at 80ppm (parts per million), which was considered ground-breaking at the time. Through the last 10 years, they’ve perfected, challenged and pushed the limits of what heavily peated whisky could be even further and today the new Octomore 8.3 is peated at an incredible 309ppm. Bruichladdich achieved what they set out to do when they created Octomore 8.3 and created the world’s heaviest peated whisky in the world. Octomore, the name means “Big Eighth”, is the world’s most heavily peated series of single malt Scotch whiskies. Each individual expression is hand-crafted by the Progressive Hebridean Distillers of Bruichladdich on the remote island of Islay. Limited, numbered editions created from stratospherically peated, Scottish barley, they mature entirely in warehouses located on the western shores of Loch Indaal. Cult classics with a devoted following, they are bottled at the distillery without chill filtration or artificial colouring. For the first time, Bruichladdich present a complete collection of Octomore, a Brobdingnagian assembly that explores the outer edges of organoleptic experience. Octomore whiskies are a sensory enigma, the Eights a potent symbol of understanding and achievement. The world’s most heavily peated single malt has had a Brobdingnagian effect on a world aching for a challenge to comfortable convention. An esoteric series of numbered, experimental, mostly very limited releases has fatally undermined the assumption that the quality of Scotch whisky is simply a function of its age. Clinging to the hill high above Port Charlotte on the Rhinns of Islay is the enigma that is Octomore Farm, for Octomore too once housed a distillery. Even older than the beautiful village it overlooks, Octomore is a throwback to the days of fierce independence, when self-sufficiency was the only option, and the legality of distillation itself still a revolutionary concept. The men who tended the fires at Octomore would have grown the barley on their land and cut the peat from their banks. The distillery burst into life in the distant days of 1816, long before the Clyde puffers were bringing coal in from Glasgow and burnt brightly for a few short years. The spirit they produced would also have been heavily peated and sold very young to a market keen to experience the unique flavours that emerge from this extraordinary island. We are confident they would have saluted Octomore today. The iron fist in the velvet glove. Octomore 8 series is the first from Head Distiller, Adam Hannet. THE BENCHMARK. 100% AMERICAN OAK MATURATION. 100% matured in first fill American oak casks. Ex-Buffalo Trace, Clermont Springs (Jim Beam). Four Roses, Heaven Hill and Jack Daniels casks. All casks full-term then vatted together. 100% Scottish grown barley – 30-mile radius of Inverness. Distilled 2008 from 2007 harvest. Winter Sun. A classic, timeless feel. MATURATION IN GREAT EUROPEAN WINE CASKS. Six years in 2nd-fill Sauternes, French Mourvedres and Austrian sweet wine casks, vatted together. Then two years ACE in first-fill Italian ex-Amarone Casks. 100% Scottish grown barley – 30-mile radius of Inverness. Distilled 2008 from 2007 harvest. Ruby Red. Exotic, rich and fruity. IS MADE FROM BARLEY GROWN ON OCTOMORE FARM. 56% full-term ex-Bourbon American oak. 44% full-term European oak ex Pauillac, Ventoux, Rhone and Burgundy. 100% Islay barley – grown and harvested from Church Field, Octomore Farm. Distilled 2011 from 2010 harvest. Golden Syrup. A thunderstorm of a dram. IS A COMPLEX MATURATION IN VIRGIN OAK – HANDLED WITH GREAT CARE. Autumn leaves. Clove, aniseed and coffee grounds. The Octomore 8 series are intentionally produced in small batches as they are limited editions showcasing Bruichladdich’s experimental style. There are only 42,000 bottles of 8.1 produced, 18,000 of 8.3 and only 12,000 bottles of 8.4. 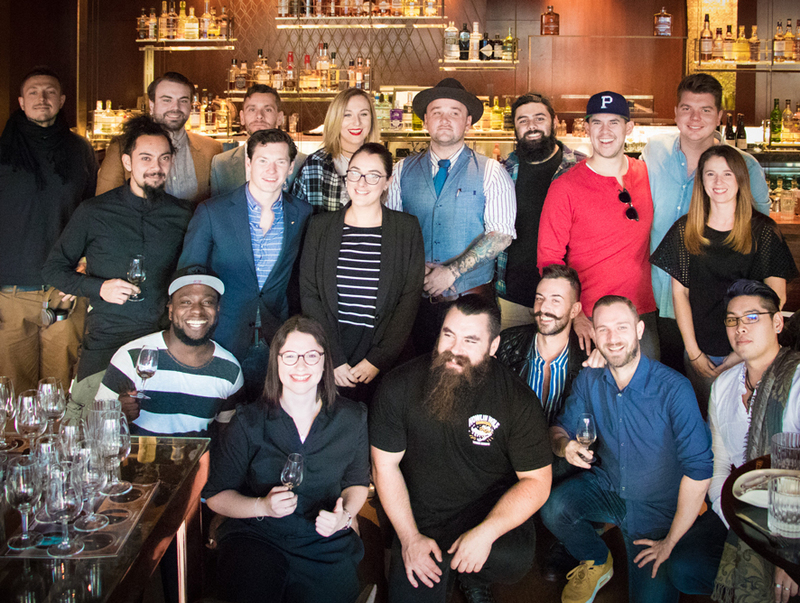 Recently, Chloe Wood, Regional Brand Ambassador revisited Australian cities to share the concept behind Octomore 8 series with the Australian bartender community. This time she was able to visit Melbourne and Brisbane in addition to Sydney. Chloe herself is on a rollercoaster in her new role, travelling throughout Asia, Australia and back to Islay several times in the last 6 months. 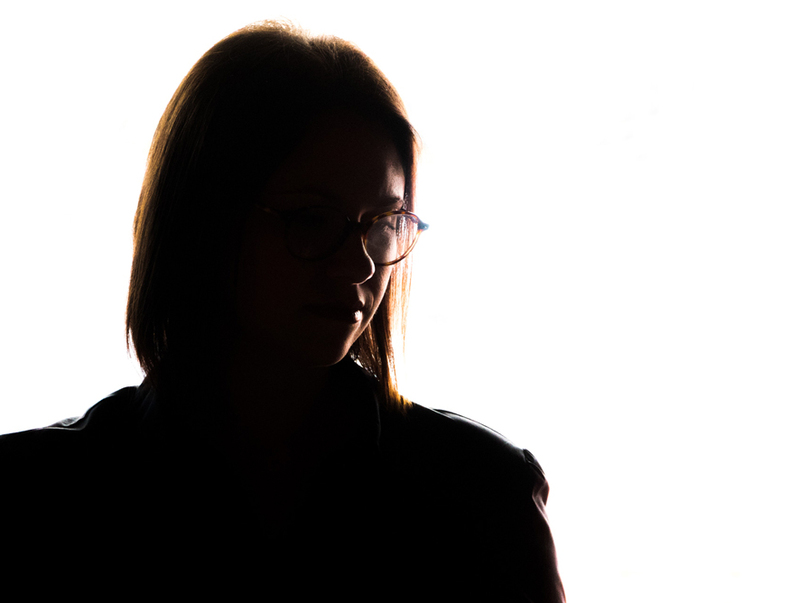 She continues to capture the imagination of our locals purely through her authenticity, love for the place she comes from, and her transparency – all characteristics of Bruichladdich itself. “Everything that they say about their brand or product can be demonstrated at the distillery” explains Chloe. It is this transparency that allows lovers of fine single malt whisky into their world. Would you expect anything else from Progressive, Hebridean Distillers? 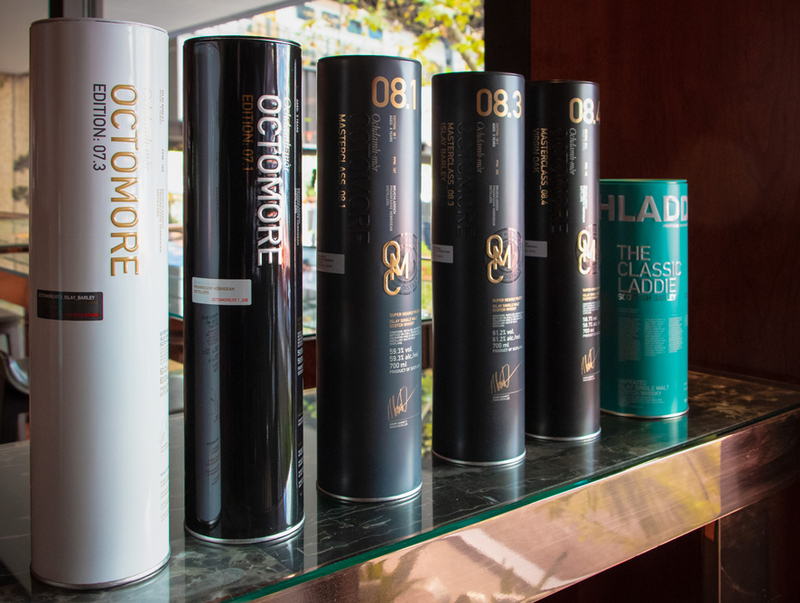 Click here for more info on Octomore 8 series.